Speaker of the House John Bercow is seen after the vote on British Prime Minister Theresa May's Brexit deal, in London, Britain, Jan. 15, 2019 in this image taken from video. 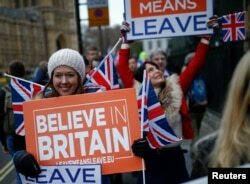 The British parliament on Tuesday overwhelmingly defeated Prime Minister Theresa May's Brexit plan for Britain's departure from the European Union, leaving in doubt how it would depart the continent's 28-member bloc of nations by the planned March 29 date. The House of Commons, on a 432- 202 vote, rejected May's call to approve what she said was the "democratic decision" of voters in a referendum 2-1/2 years ago to leave the EU. Opposition Labor Party leader Jeremy Corbin called the vote a "catastrophic defeat" for May's Conservative Party rule and demanded a vote of no confidence on Wednesday in what he said was the "sheer incompetence of this government." Prime Minister Theresa May sits down in Parliament after the vote on May's Brexit deal, in London, Britain, Jan. 15, 2019 in this image taken from video. The vote against May was widely expected, but it is not clear what comes next for Brexit. Before the vote, May warned parliamentarians that the EU would not offer an "alternative deal." "The responsibility on each and every one of us at this moment is profound, for this is a historic decision that will set the future of our country for generations," May said. 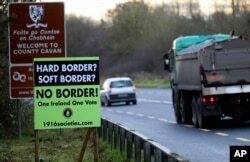 FILE - A poster against a hard border stands on the border between Northern Ireland and the Republic of Ireland near the town of Derrylin, Northern Ireland, Dec. 12, 2018. One of the key provisions in her plan sought to avoid a hard border between EU member Ireland and the British province of Northern Ireland, in order to prevent the return of border checks if Britain and the EU failed to reach a free trade agreement after a 21-month transition period. May's deal would have preserved the rights of more than three million EU citizens living in Britain and the one million British living in the EU. Britain would have paid $51 billion to settle its financial responsibilities with the EU. An anti-Brexit protester demonstrates outside the Houses of Parliament, ahead of a vote on Prime Minister Theresa May's Brexit deal, in London, Britain Jan. 15, 2019. Now, it is not clear whether Britain will move toward a "no-deal" break with the EU, push it toward altered terms of departure or even trigger a new referendum on whether to leave. May canceled a previous vote in December when it was clear she did not have enough votes for the deal to pass, and since then little seemed to have changed. The May plan drew opposition from both sides of the debate over Brexit, with those favoring a split saying her deal would still leave Britain tied indefinitely to EU rules, while opponents favor even closer economic links to the rest of Europe. Pro-Brexit protesters demonstrate outside the Houses of Parliament, ahead of a vote on Prime Minister Theresa May's Brexit deal, in London, Britain, Jan. 15, 2019. 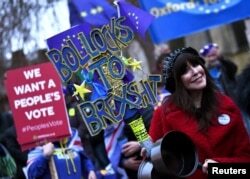 In the streets outside the House of Commons, rival bands of pro-EU and pro-Brexit protesters kept up a steady cacophony of chants, drums and music. One group waved blue-and-yellow EU flags, the other carrying "Leave Means Leave" placards. Negotiators from Britain and the EU agreed to the terms of the Brexit deal in November after difficult talks, and with the British parliament voting against the agreement there is great uncertainty about what will happen next. May has until next Monday to put forth a new proposal.